The bulbous root is a little too wide for the opening of my new pot. 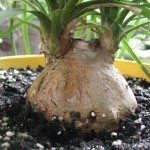 Can I shave the sides of the root without causing irreparable damage to the plant (any more than I already have)? Sorry, you can't "shave" the sides. You need a pot large enough to accommodate the ponytail, so it will look attractive and balanced in its pot. The pot should be large enough to leave at least 2" of soil around the outside of the trunk. Also a shallower pot would look better, I think. You should be able to find another plant that would look handsome in that nice pot.